I loved this little book even though it's not my style. I normally read fantasy and this book is realistic fiction. This book may also make you sad as you read about a young boy named Salva. He was forced to run away from his family because there is a war threatening to kill them all. At first he didn't know where he was going, but soon after he figures out that he's walking to Ethiopia from his small village in Sudan. This book doesn't have only one story in it. 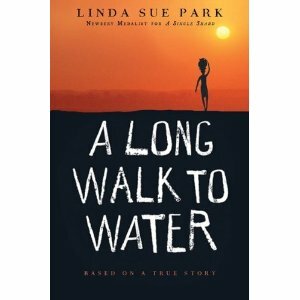 The other story is about an 11 year old girl named Nya who has to make a 4 hour trip to the watering hole and back again, twice a day to get water for her family. She also lives in a small village in Sudan. But the two villages are at war. Soon the watering hole dries up and Nya and her family have to move to a different site so Nya can get the water. I loved this dual narrative book. I think this book would be a good sized book for a third-fourthish grader. But if a third grader read this book I think they would be sad. It's a very short read but it's a good one. When I read it I felt lucky that I didn't have to go through his life. To know what some people had to go through in their lives really helped me understand that I have a pretty great life. The sadness came from all the loss that Salva suffered over the course of the book. I think that ages 10ish and up should read this book.